How Much Are Big Authors Worth Per Word? #infographic ~ Visualistan '+g+"
It’s been quite a long time since the days of Dickens, in which authors were rumored to be paid per word for their flourishing prose. Now, authors make most of their money with merchandising and movies; book purchases usually make up only a fraction of their value in terms of royalties. However, in a simpler world, where we only take the words they produce into account, how much would they make if you compare their word output with their total earnings for the year? 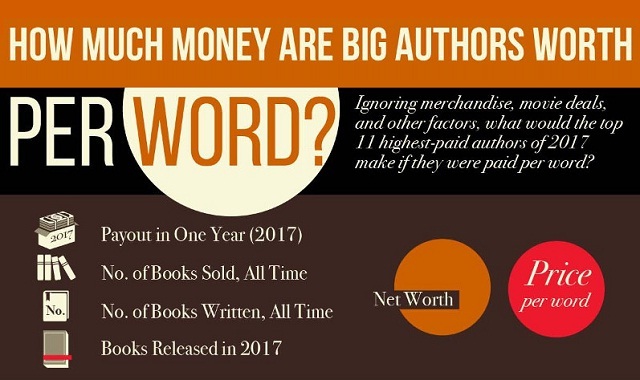 We’ve gathered data on the richest authors in the word: their net worth, their yearly payout, their number of books sold, and the wordcount of the books they released or co-wrote in 2017. It’s pretty incredible! Could you imagine getting paid hundreds of dollars per every word you produced? While the world doesn’t quite work that way, it’s still pretty interesting to think that every time the keyboard strikes a new combination of letters Stephen King gets $67.20. What would your favorite author make per word?